"The program takes a unique approach to healthy eating; there is something for everyone and, therefore will be able to serve a broad client base. The approach made me feel that it was tailored for and speaking to my needs on a..."
"I love that Path for Life is not an ordinary diet. It takes into consideration that each and every one of us have different lifestyles, bodies and needs. It is a guide with helpful information and tools to make changes not only..."
"This program is rich with both information and strategies..to negotiate an important life transformation. Complex, intelligent,challenging material and yet the steps allow for "simple" absorption. This is the opposite of typical..."
"Working with Jeanette over the years has given me access to care tailored to my unique concerns and goals. Her holistic and integrated approach (body, mind and food) has left me healthier and confident about food choices, preparation and how to listen to my body and follow through for positive results. I'm excited to see this creative program on line, providing broader access to all!" "The program takes a unique approach to healthy eating; there is something for everyone and, therefore will be able to serve a broad client base. The approach made me feel that it was tailored for and speaking to my needs on a personal level. I consider it a permanent reference to support healthy eating and enjoying food on an ongoing basis." "I love that Path for Life is not an ordinary diet. It takes into consideration that each and every one of us have different lifestyles, bodies and needs. 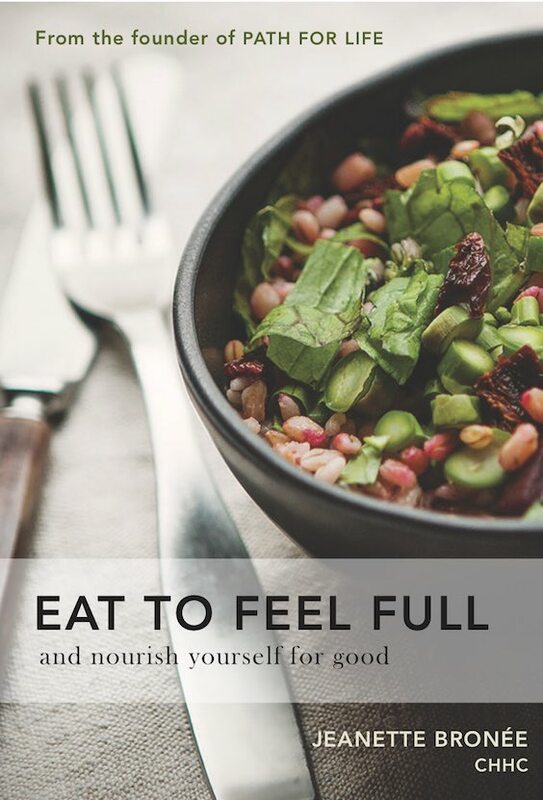 It is a guide with helpful information and tools to make changes not only with your food but with your habits and the way you think. There is no quick fix, and this program goes deeper and brings all aspects of a nourished life into a whole. I believe what I read and feel encouraged and inspired to live keep on living a healthy life." "This program is rich with both information and strategies..to negotiate an important life transformation. Complex, intelligent,challenging material and yet the steps allow for "simple" absorption. This is the opposite of typical internet drivel..it is a highly original and well organized treatise of human being nourishment and self care." "I started this online course because my food choices were getting boring and not as good as I wanted them to be. I was really not eating enough food and filling those spaces with mostly snacks. After session one and two having added better food choices and eating three solid meals my cravings have lessened tremendously. When I find myself looking for cookies or chips i ask myself , are you hungry? The answer is 9 times out of 10 no! This is real progress for me, for the first time I understand or better said I am more conscious of mindless eating. I was able to make a better choice and more than not I did without the cookie or chips and grabbed a cup of tea. Yaaay!! I really don't want that mid life belly:))). Gonna keep at it!! Two thumbs up!!!!"